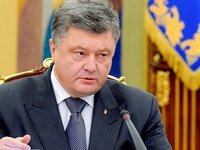 Ukraine reduces natural gas consumption every year, President Petro Poroshenko of Ukraine has said. "Do you know how much [natural] gas Ukraine consumed in 2017? 14 billion cubic meters... Do you know how much gas Ukraine used in 2018? 10.5 billion cubic meters. And this is our decisive step toward improving energy efficiency and ensuring the energy independence of our nation," Poroshenko said at celebrations on the occasion of the 85th anniversary of the JSC Turboatom in Kharkiv on Thursday. The president also said that the gradual ousting of Ukrainian enterprises from the Russian market started not in 2014 but in 2009. Poroshenko recalled that it was then that agreements were concluded, according to which Ukraine paid an inflated price for gas consumed and undertook to buy 52 billion cubic meters of gas from the Russian Federation annually, regardless of its consumption volumes.